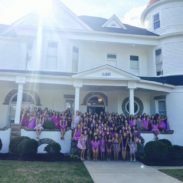 Historic Preservation | Dublin Construction Co., Inc.
Dublin Construction recently completed the renovation of 398 S Milledge in Athens for Delta Phi Epsilon International Sorority. The project was completed in less than 8 weeks, just in time for Fall Rush. The 6500 square foot structure was originally constructed in 1890. Congratulations to these ladies on their new home!